The London Book Co. seems to have been (at least from the late 1920s onward) a subsidiary of Collins (Collins Classics, etc.) aimed to compete for the same market as the Readers Library: very cheap fiction hardcovers with gaudy dust jackets. Before the late 1920s, a London Book Co. imprint shows up on some reprint series (around 1906, with A Century of French Romance or A Library of French Masterpieces series of reprinted French literature). 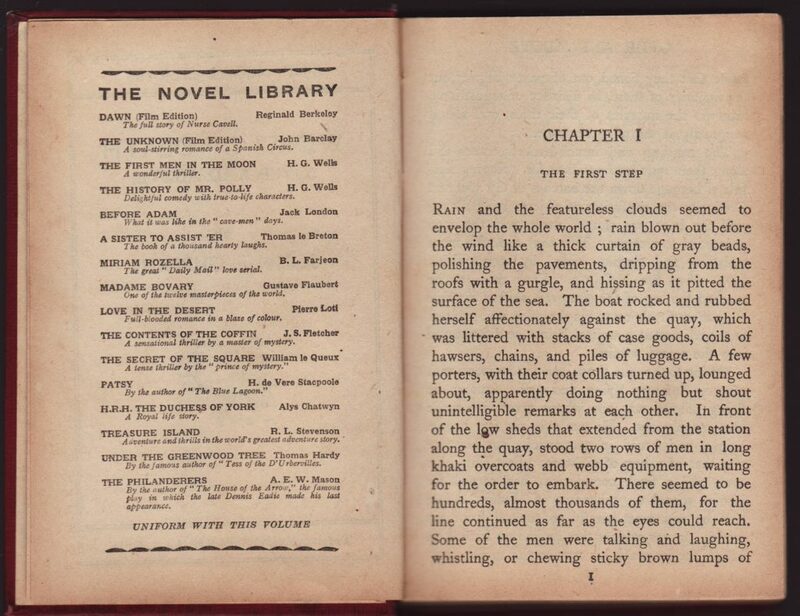 By 1909 they began publishing a broader selection of classic reprints, bound in leatherette bindings and seemingly in sets but I have not found a specific series name assigned to these titles. It is not known if this earlier London Book Co. was the same as the one publishing the Novel Library, or how long Collins was associated with them. Novel Library books sometimes have a serial number, and I have seen up to #208 (see the front jacket flap of Galsworthy’s In Chancery, below), so at least that many titles were published. Novel Library titles stop appearing in the late 1930s although a firm under the name of the London Book Co. remains selling books in London, and publishing a few dictionaries and miscellaneous titles until at least the late 1950s. This Novel Library copy of G.E. 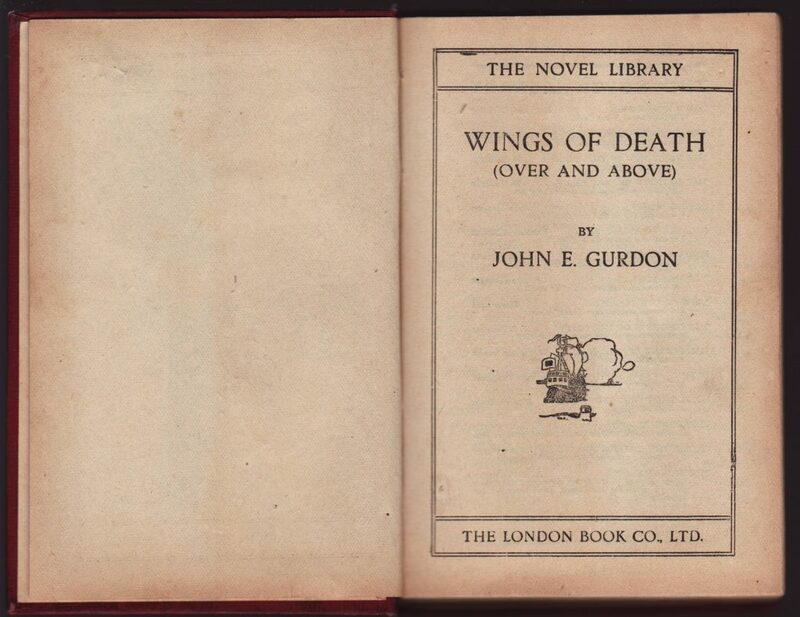 Gurdon’s Wings of Death is a retitled reprint version of WW1 flying ace John E. Gurdon’s Over and Above (published by Collins in 1919). The book has no printing date but probably 1929 (source). 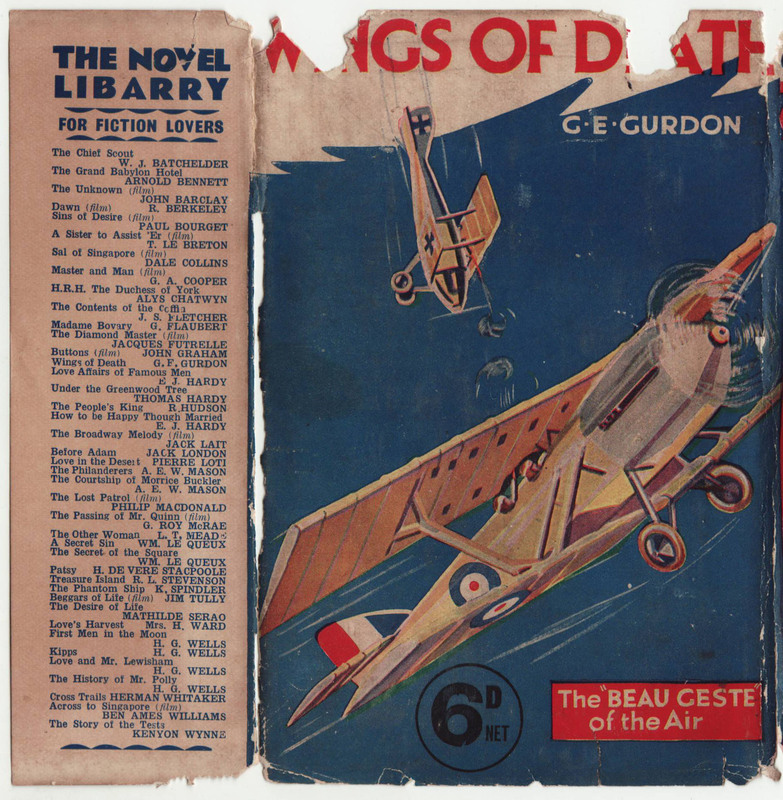 The front and back artwork on the jacket along with the painfully cheap binding is reminiscent of the Readers Library, which had been published since the mid-1920s. Jackets are unique to each title and include the price (6d) on the front and back of the jacket. The title is blurbed on the front jacket flap, and a few dozen additional titles are listed on the rear jacket flap. This particular book does not seem to have a serial number (on the jacket or book). 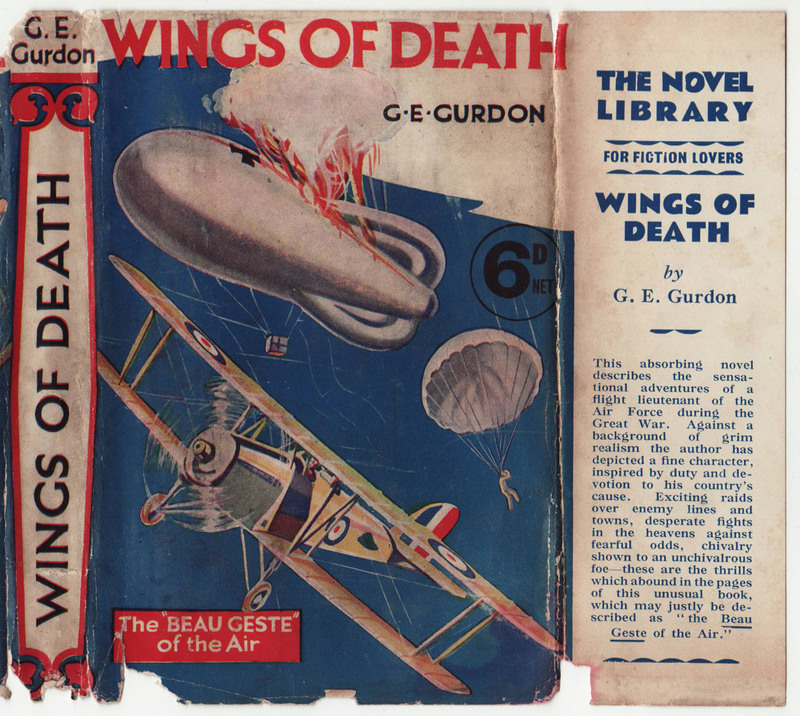 The front, spine and front flap of the book with its blimp attack artwork and parachuting blimp pilot. Bindings are cheap cloth with gold typography and decorations. “The Novel Library” appears at the base of the spine. There is no half-title page. The title page includes a sketch of a warship sailing off into the sea. There is no copyright nor date in the book. The back of the title page lists 16 titles in the series, each with a very brief blurb. An incomplete list of titles in the London Book Company’s Novel Library series by serial number. This list is taken from the copy of In Chancery, below, the only copy of a Novel Library book with a series list with numbers. The copy of Wings of Death (above) which was published earlier than the Galsworthy titles (below) does not have a serial number, suggesting the series was not originally numbered, at least on the jackets or books. The three books below by John Galsworthy were published in the Novel Library series in the 1929-1931 time frame. In all, six Galsworthy titles were available in the series. 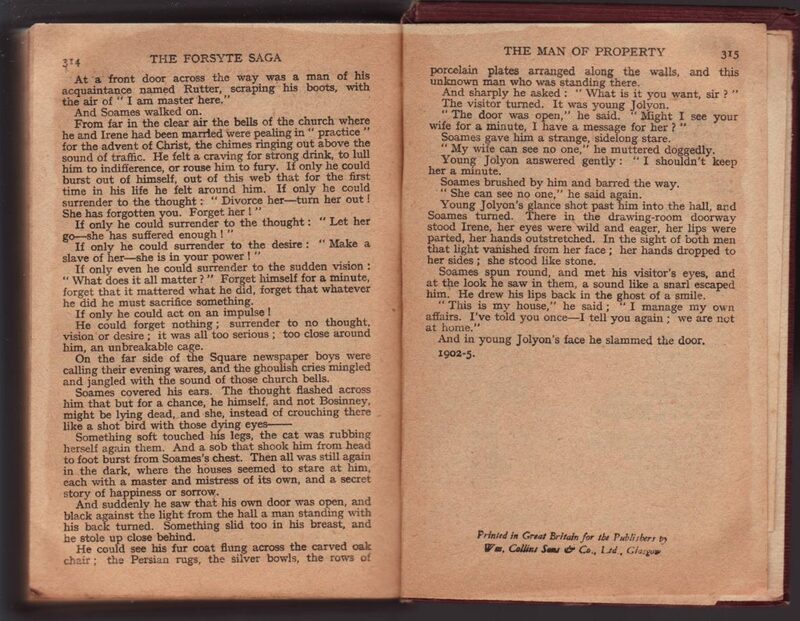 The Man of Property (the first book in the Forsyte Saga) repeats the artwork on the back and front of the jacket. It has a serial number of 146 on the front jacket flap. This number is not indicated in the book. Also, there are nowhere near 146 titles listed in the “complete list of titles” in the book itself: this suggests the “complete list” was incomplete (possibly not listing books in the series that were out of print). 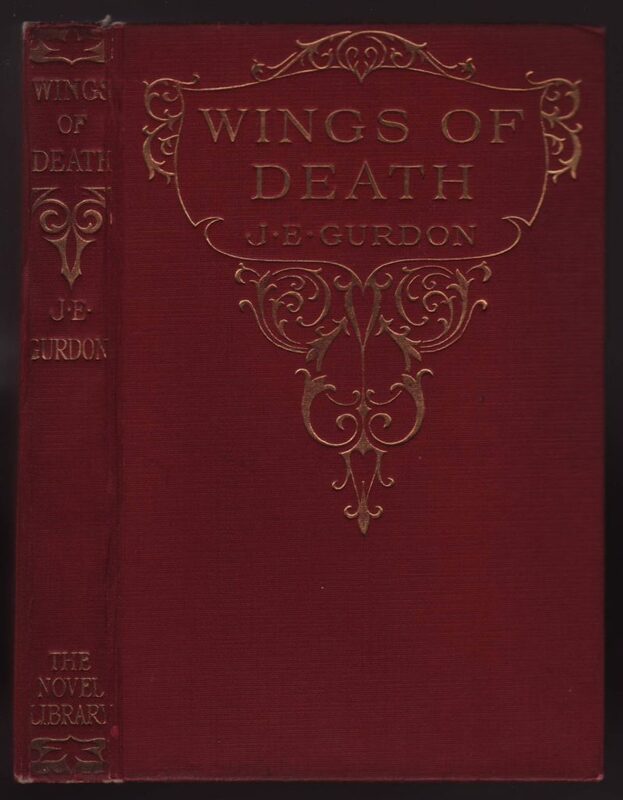 The list of titles has expanded from the list on the Wings of Death title above. 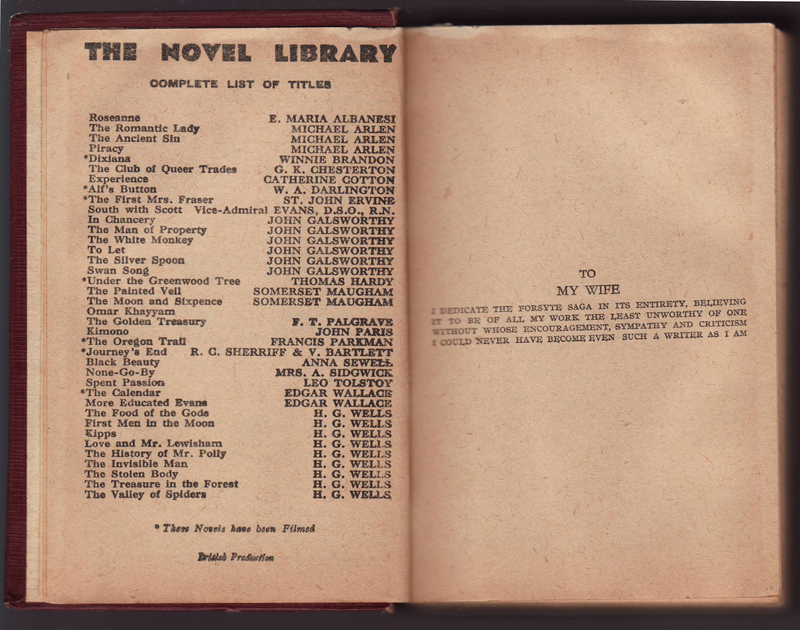 The list, following the title page, also indicates titles that had been filmed. This seems to be a nod to the competing Readers Library series which used movie tie-ins to sell their books. The printer’s imprint at the end of the book indicates “Printed in Great Britain for the Publishers by Wm. Collins Sons & Co., Ltd, Glasgow” This is the reverse of the imprint on the title page (printed for Collins by the London Book Co.). With such cheap books, apparently, no one cared to get the publisher’s details correct in the books. 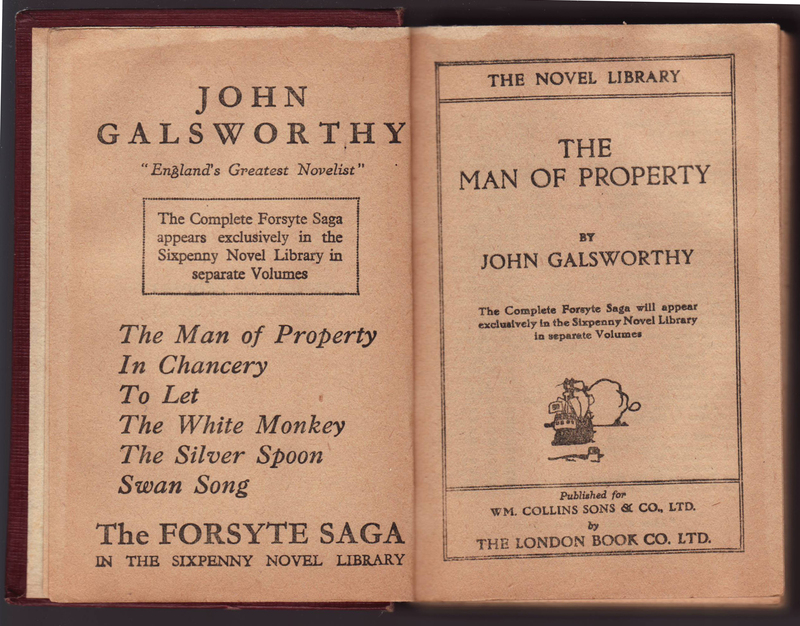 The dust jacket for Galsworthy’s In Chancery (#149) and The White Monkey (#176) follow the same pattern as The Man of Property (above): repeating the artwork on the front and back of the jackets and including lists of other titles in the series and synopses of the titles on the jacket flaps. 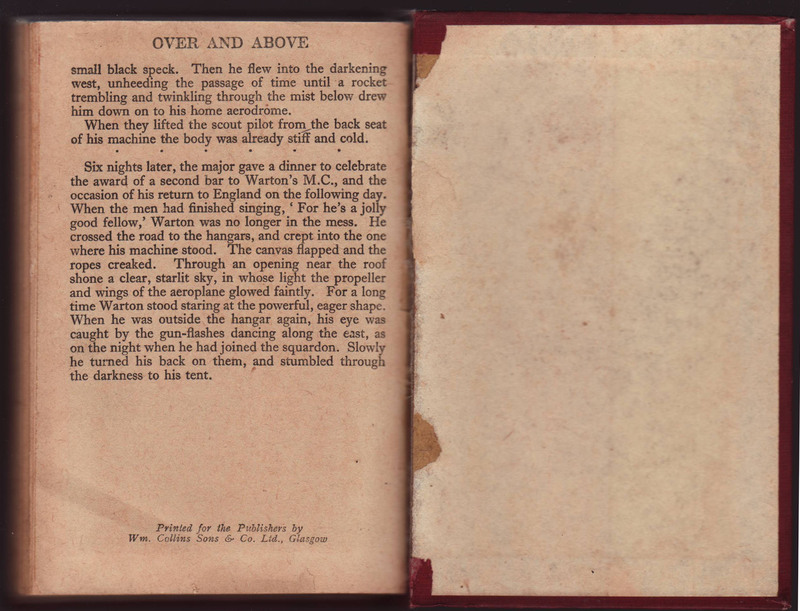 The books themselves are similar to the two copies shown above. The In Chancery title (below) lists titles up to serial number 208 on the front jacket flap but does not include 208 actual titles.